OVM - Building hope > Welcome to Ahmed & Julie with your support – make your gift for the end of thr year 2018! Overmolen builds up on hope, you surely know this! The project that we have started will surely become a beautiful story, but in order for this to happen we ask for your financial support!Yes, we can finally start it! 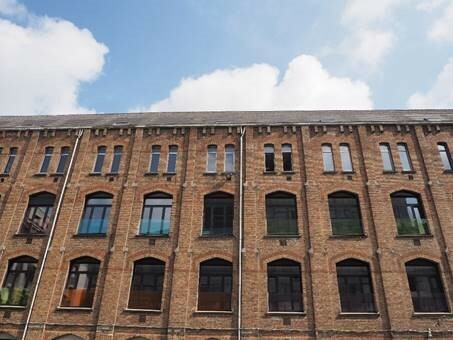 Beginning of 2019, after a long time waiting, we can start building our eleven studios on the Sint-Joris site in the heart of Brussels. That way, we are continuing the existing Samenhuizen project, which has housed people of vulnerable groups since 2017. Samenhuizen bis is being extended to a combination of unaccompanied minor students, asylum seekers and victims of human trafficking. Thanks to this unique cohabitation project, we want to offer young people a wider network and thus stimulate integration on the one hand and give students the opportunity to actively engage with less privileged people in our society on the other hand. To do this, we need your support! That’s why we’ve opened a “project account” at the “Roi Baudouin Foundation”, which allows us to receive your donations and a tax certificate in exchange for an amount of 40 euros. This way, you will get a 45% tax reduction on your deposited amount . A true a win-win situation !! Help us ensure that Ahmed and Julie actually live together, with 9 other people as well, make a donation before the end of the year on the following account number: BE 10 0000 0000 0404 with notification 128/3024/00053. You feel that you can contribute another way to the realization of our project ? Through advice, material support or as a volunteer? Contact Sofie Vancoillie to see what we can do together. Thanks to this newsletter, we will keep you informed of any progress in this big 2019 project!